What is it? A new zone and questline intended for high-level players. Multiplayer The main game has it, but this DLC is singleplayer-only. Then there's the middle ground. 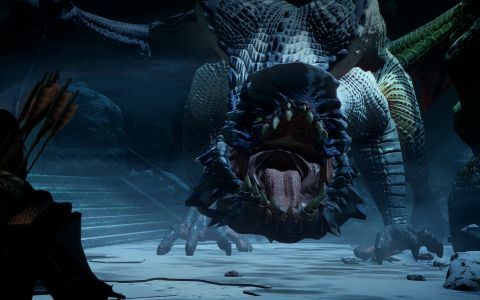 Remember Dragon Age: Origins' Golems of Amgarrak? For some reason, I do. How about Mass Effect's Pinnacle Station? BioWare has a history of putting out DLC that—if not entirely filler—is certainly missable. New healthbars to whittle and new gear to find with companions whose voices are notably absent, following plotlines that add little to the whole save 'here is where your guy got this hat'. I'm going to level with you: that is exactly what I expected Jaws of Hakkon to be. It bears the signs: released in relatively close proximity to launch, a plot that—ostensibly—could just be an excuse for a dungeon crawl, and a very prominent new hat on the splash art. I was wrong. After eight happy hours with the DLC I'm glad to report that none of the paradigms above quite fit. Jaws of Hakkon adds a new open-world region to Inquisition, the Frostback Basin. It's not the largest wilderness in the game—it's comparable to the Western Approach, I think—but it's notable for its extensive verticality. Despite the name (and location at the southern tip of the Frostback Mountains), this isn't another icy plain: it's a verdant, autumnal valley with landscapes that vary from treacherous cliffside pathways to vine-tangled riverbanks and gloomy azure swampland. Your Inquisitor arrives in the area following a tip that promises to lead to the resting place of their predecessor, the Inquisitor Ameridan, who vanished 800 years ago. Ameridan occupies an (until now) underdeveloped strand of Dragon Age history and his story, at first, doesn't seem to have much to do with Inquisition's main campaign. It needn't: this is a side-show, designed for high-level characters, and while it reflects on some of the themes of the overall plot it sits comfortably aside from it. Your pursuit of Ameridan brings you into contact with the Avvar, Thedas' southern barbarians. Their society is part-Cimmeria, part-Wildling, and while they've been mentioned in every game in the series they've never really been explored until now. One of the main narrative draws of this DLC is getting to find out much more about them, and the sensitive rendering of their culture and views on magic offers yet another interesting angle on the series' central debate. Stone-Bear Hold, the main Avvar village, is stunningly rendered: set into a cliffside overlooking a lake, buzzing with life and activity. The Avvar of Stone-Bear Hold are, like you, in conflict with another tribe—the titular Jaws of Hakkon, mad worshippers of the Avvar god of war. Their plan to resurrect their god in the form of a dragon is linked to the mystery of Ameridan, and in thwarting the former you have a shot at solving the latter. Most of the DLC takes place in the open world, with traditional Inquisition activities like closing rifts and hoovering up shards mixed with a decent selection of side quests. It's a familiar set, however, and ticking all of Frostback Basin's boxes doesn't feel especially different to any of the game's other larger zones. Where it differentiates itself is in the scenery—this really is a stunning game, when it wants to be—and in the level of detail invested in the telling of the main plot, which culminates in an exciting finale that hews closer, in terms of production values, to the main game's better critical path missions. If you start playing and wish you were seeing more cutscenes, don't worry: you'll get them. There's loads to like: uncovering the history of Ameridan reveals a figure who was not unlike yourself, and his relationship with his own companions is an opportunity to reflect on your own. They don't play a huge role in the plot, but BioWare did go to the effort of bringing back the voice cast to record new lines for this expansion. It's not a huge amount, but it's to the same degree of quality as Inquisition's regular party banter—which is to say very high. Jaws of Hakkon has a few standout moments of comedy of its own, including a post-ending bonus quest in Stone-Bear Hold that made me laugh out loud. Also good: the new gear, which includes a set of on-brand Inquisition dragon-huntin' gear and a lot of glowing ice-weaponry. You can find schematics for the latter, too, so it plugs neatly into the existing crafting system. The Inquisitor receives a cool new power in the form of a dome-shield that deflects ranged attacks. Strategically placing it to protect my archer-Inquisitor and Dorian from enemy mages demonstrated how useful it might be in certain parts of the main game. Less good: combat. Jaws of Hakkon promises to mix up the formula but, despite one or two inventive encounters, the vast majority of your battles will go as you expect them to. The Avvar you fight fit into the base game's familiar archetypes—stealth guy, archer person, wizard, nine-foot tall man with hammer—and while they arrive in a few new configurations little of it mandates a different tactical approach. There's a lot of fighting, too, and there are times when you'd rather get on with your day rather than murder another family of gigantic salamanders. It's also pricey. £12/$15 is a lot for five to eight hours of play, particularly when much of it is pretty familiar. I love Inquisition and I'm happy to get more of what Jaws of Hakkon offers, but if your enthusiasm for the game is solely based on its more cinematic moments then you might find this a little thin. It's more Hinterlands than Winter Palace, put it that way. On the other hand, it's really good Hinterlands, the story is exciting and longstanding Dragon Age nerds will come away with more to think about vis a vis gods, dragons, and what is up with gods and dragons. Fans will also be pleased to hear that the series' long-running central theme—'for heaven's sake, don't put that in your mouth'—is alive and well. I'm happy to have been shaken out of my somewhat cynical view of BioWare DLC. Jaws of Hakkon isn't Lair of the Shadow Broker-grade essential, but nor is it Golems of Amgarrak. It's basically Mass Effect 2's Overlord. Remember Overlord? It was very good. So is this—and it sets a strong precedent for the future of Dragon Age: Inquisition. I'd happily play another like it.